Whatever I want to think, I want to feel ... they are all entirely up to me. 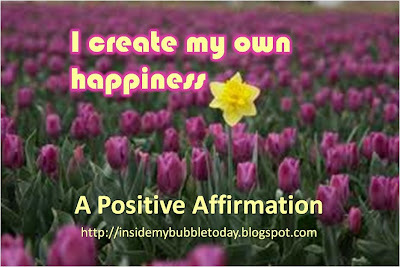 I get to choose and I am definitely creating my own happiness with every brand new day. There's no room for regrets nor is there any room for fear ... I will march forward because everything is so bright and adventurous ahead! A toast to that!! Thanks and have a great week ahead! My Bubble: Procrastination Is Evil! My Bubble: Going Under The Scan! My Bubble: Making It Random! Law Of Attraction: Are You The Worrying Kind?